He inhaled his first dose of rice flour (1/4 tsp mixed in applesauce) and could barely wait the 20 minutes until his next dose (1/2 teaspoon mixed in applesauce). The rest of the day was gloriously boring. There was no sign of any problem or discomfort and we were out of there by 1:00! E was such a good boy that we decided to embark on our annual trip downtown to see the Christmas Light Show and Santa Claus at Macy’s. He was very excited to see Santa and ask him for his “own kitchen” following a recent disagreement with mommy about his presence in her kitchen. 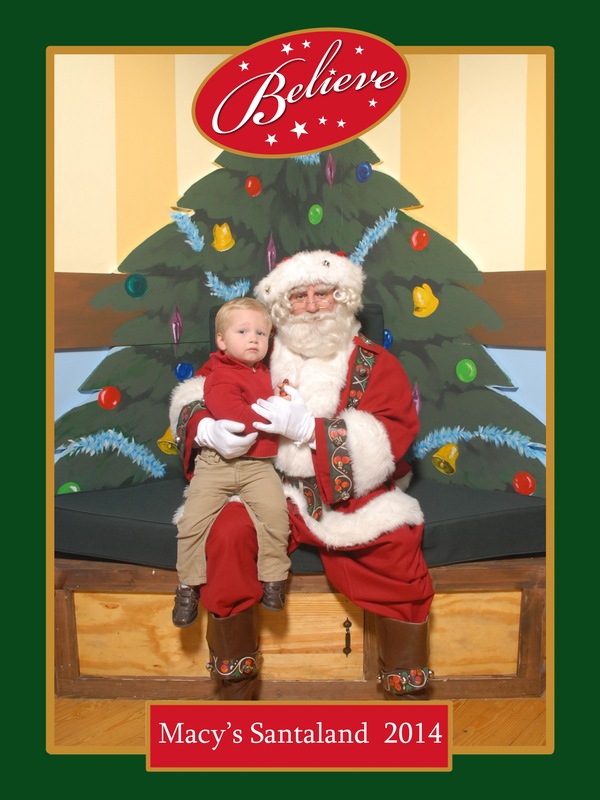 The nostalgia of the light show was totally lost on him but he loved meeting Santa Claus. He ran right up to him and gave him a hug. Then he got shy and uncertain but, with some encouragement, he submitted his request and posed for an obligatory picture with no tears at all. Jonathan and I were in awe of what an amazing little boy we have. He is so flexible and brave! We are so lucky. Mommy and Daddy left the hospital on Monday in a totally different mood than two weeks prior when we left the dairy challenge. The rice challenge really felt like a pass. We weren’t hesitant to call it that and we weren’t just waiting for the other shoe to drop. We really felt like things were good. 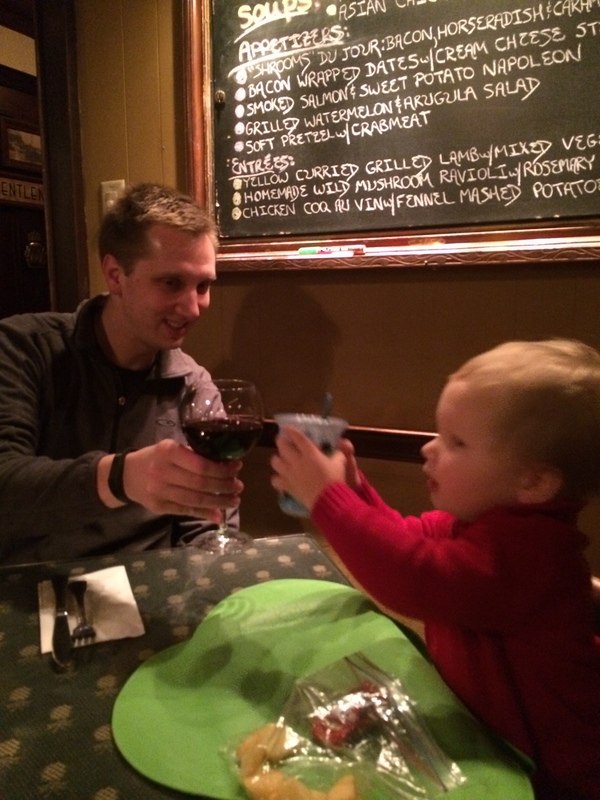 That definitely called for a celebration so we decided to take E to one of our favorite local restaurants. We still brought all of his food (we weren’t ready to get crazy) and had a great time enjoying wonderful meals (and a celebratory beverage for mom and dad). Again, we couldn’t believe that after a day that was totally out of he norm, with no real schedule, and a 20 minute nap he was still incredibly well-behaved at the restaurant. Perhaps he will get to “go out eat” more often. The way we felt leaving the rice challenge – like a weight had been lifted – really put our feelings about the dairy trial in perspective. Dairy still doesn’t feel like a pass. We can’t explain it, there aren’t any concrete reaction symptoms, but it doesn’t feel right. So we are going to put dairy on hold for now. 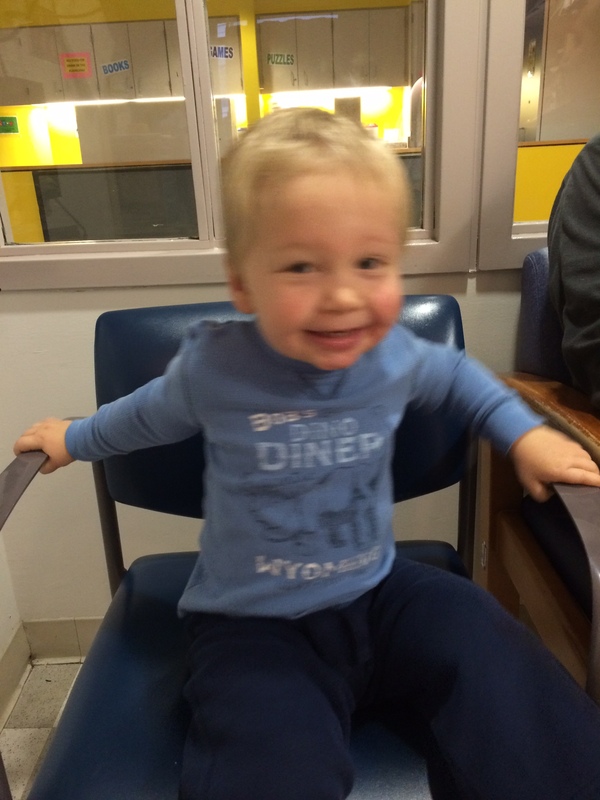 Dairy did come off the official allergen list in E’s medical record and we are less likely to body check a toddler waving around a goldfish cracker, but we aren’t going to be offering him cheesecake any time soon. We’ll retrial it systematically in January. Right now we’ll focus on rice and oat (which we start in a week and a half) and enjoying Christmas (even though it will still be dairy-free). So we are in the middle of the at-home portion of the rice trial. There was a different attending allergist at this trial than the last and the trial protocol we were sent home with was very different from the one we got for dairy. We were told to give E 1 tsp of rice for two days, 2 tsp for 2 days and then 1 tbsp for a day. The difference between this protocol (5 days) and the dairy protocol (12 days) makes me feel not at all guilty about changing it up to conform to our trial protocol. So our plan is (after the 3/4 tsp in the hospital on the first day) 1 tsp for one day, 2 tsp for two days, 1 tbsp for two days, 2 tbsp for 2 days, 3 day break, 2 tbsp for one day, 2-4 tbsp for two days. We are using rice baby cereal mixed with applesauce because E loves applesauce. We are hoping for less drama and fewer games than the milk trial. Thank you! It’s been about 21 months since E’s last exposure to rice and oats. Alot of recommendations say to wait 12-18 months but I think you’re smart to wait, the longer the better. It feels like forever at first but starts to become the norm eventually. You’ll be there before you know it. It’s funny you bring up doing it at home vs the hospital. Jonathan and I were just talking about skipping the hospital next time. There are pros and cons of both so talk to your doctor and go with your gut. Good luck!! Yay. I love reading this!